We’ve all experienced what happens when we skip breakfast; fatigue, brain fog, and irritability set in and slow us down. Without breakfast, what fuel are our kids running on? Jan Marie is going to discuss why breakfast is important, and provide you with some healthy breakfast recipes to shop online. The best part? You can have the ingredients delivered to your door! Each day our body requires a broad range of essential nutrients, iron, calcium, vitamins B and C, and omega fatty acids. All essential for growth, brain development, immunity, and overall good health. Children who eat regular meals, including breakfast, are therefore more likely to meet these daily nutritional requirements. Maintaining a balanced blood sugar level is another crucial reason to start the day with breakfast. We’re about to get technical – you’ve been warned. Blood sugar (blood glucose) is transported via the bloodstream to the cells in the body to supply us with energy, which our body is always trying to regulate. When we eat food high in sugars/carbohydrates, our glucose levels spike and then rapidly drop. Blood glucose levels also drop after extended periods of not eating. As a result, we battle with brain fog, irritability, and fatigue. Levels are at their lowest first thing in the morning, making breakfast so important to maintaining happy, healthy, productive kids (and us adults, too). Keeping blood sugars balanced not only helps with sustained energy and focus but also helps with healthy weight control and prevention of disease states such as diabetes. By creating healthy eating patterns many other disease states can also be avoided. A balanced breakfast can be both quick and simple to prepare, so no excuses! Above all, aim to fit in as many nutrients as possible. If you can add in a piece of fruit or vegetable, do it! Ensure your breakfast has fibre, good essential fatty acids and an added source of protein. These can all help to ensure a longer lasting, balanced energy source to sustain you and your kids throughout the morning. Sneaky Trick: Hide a handful of baby spinach or avocado in a chocolate smoothie to get the kids to eat more greens. Shhh, they’ll never know! 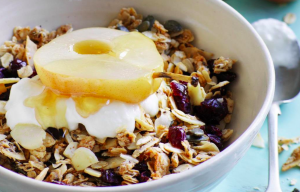 Breakfast Inspiration with Recipes You Can Shop! 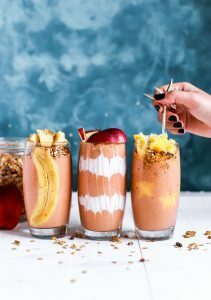 Now that we’ve gotten you all excited about breakfast, here are some healthy breakfast recipes that you can shop online with Playt! 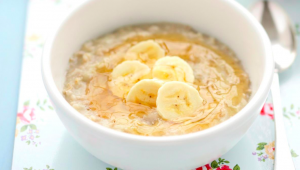 A classic breakfast staple, use rolled oats to make porridge in the morning. Add a source of protein like whole yogurt, or a handful of crushed or ground nuts. Make it more exciting by adding cacao to make chocolate oats! Chia seeds soaked overnight in your choice of liquid (almond milk and coconut water are great options). 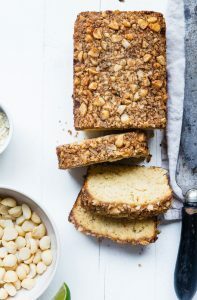 Top with fruit, nut butter and naturally sweeten with a bit of maple syrup, coconut syrup, or stevia. This is a great option if you’re strapped for time because you prepare it the night before! 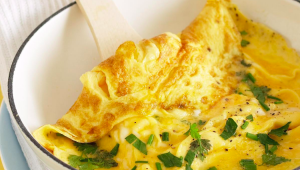 Another breakfast classic, omelettes give your kids the much-needed protein to get them through the day. Give them a piece of fruit on the side to fill them up. Combine with fruit and nuts or some homemade muesli, it’s as easy as that. A great breakfast for adults and children alike and the options are only limited by your imagination! 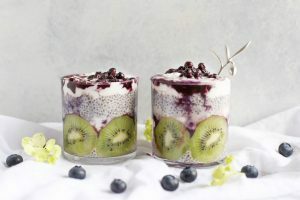 Think fruit, good fats such as chia seeds and avocado, cacao, natural whole yogurt, natural hemp, whey, pea and rice combination protein powder, and whole nuts or nut and seed butter for protein. 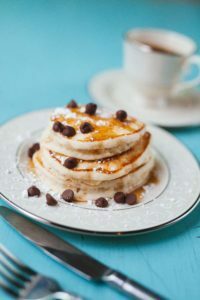 No kid is going to turn down pancakes, so let’s make them healthier by substituting oats for flour and banana for sugar. If you want to add a source of protein you can add a natural protein powder or a nut butter as a topping. Voila! A quick, balanced and most certainly, a yummy breakfast. For breakfast? Yes, please! 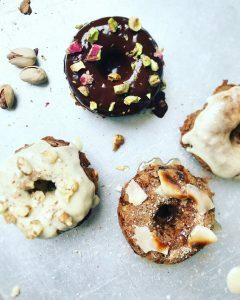 This breakfast donut recipe is a healthy and exciting breakfast alternative that’s sure to get kids excited. Do-nut skip breakfast! Another classic, and for a reason. National Institute of Health (2016). Added sugar intake and metabolic syndrome in US adolescents: cross-sectional analysis of the National Health and Nutrition Examination Survey 2005-2012. Last accessed 17th May 17 https://www.ncbi.nlm.nih.gov/pubmed/26932353. National Institute of Health (2013). The effects of breakfast on behaviour and academic performance in children and adolescents. Last accessed 17th May 17 https://www.ncbi.nlm.nih.gov/pmc/articles/PMC3737458/. National Institute of Health (2013). The most important meal of the day: why children skip breakfast and what can be done about it. Last accessed 17th May 17 https://www.ncbi.nlm.nih.gov/pubmed/23992210. National Institute of Health (2013). What is metabolic syndrome, and why are children getting it? Last accessed 17th May 17 https://www.ncbi.nlm.nih.gov/pmc/articles/PMC3715098/.